It has been requested that this article be rewritten and expanded to include information about Puzzle & Dragons: Super Mario Bros. Edition. Big Whomps are a larger sized species Whomps. They are rather rare types of Whomps, having only three appearances. 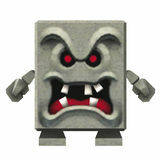 They are similar to Big Thwomps, as they can also break through Brick Blocks. One Big Whomp makes an appearance in New Super Mario Bros., where it resides in World 3- . It can be defeated through use of a Ground Pound. It behaves in the same way as normal Whomps, only it can walk around freely instead of staying stationary in the background and falling on Mario or Luigi. Big Whomps reappear in New Super Mario Bros. 2. They appear in World Mushroom - and World Star -3. Like the other games Big Whomps can only be defeated with a Ground Pound, Big Whomps are again able to walk around, but they can also be seen in the background. Once a Big Whomp in the background falls, there can be coins, Roulette Blocks or even a Red Ring behind them. Big Whomps reappear in Puzzle & Dragons: Super Mario Bros. Edition as enemies and allies to Mario. They can also be created from regular Whomps. ↑ von Esmarch, Nick. 2012. New Super Mario Bros. 2 Prima Official Game Guide. Page 31. ↑ Shogakukan. 2015. Super Mario Bros. Hyakka: Nintendo Kōshiki Guidebook, New Super Mario Bros. section, page 114. This page was last edited on December 17, 2018, at 03:53.